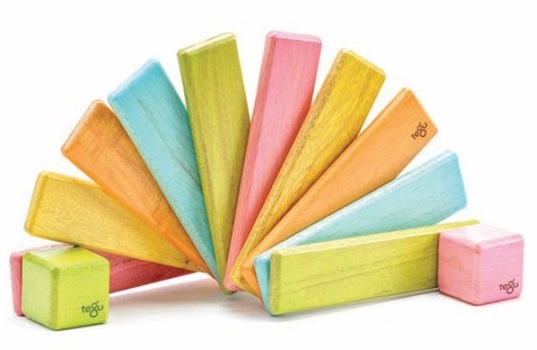 We’ve seen the amazing Tegu Magnetic Wooden Blocks before, but we’ve never seen colored Tegu blocks, that is, until now. Tegu is now making their beautiful blocks in a rainbow of colors; green, orange, turquoise, pink, and yellow. Like the classic, natural Tegu blocks, these new tinted blocks are still made with child-safe magnetic ability that allow little ones to create magical and steady 3D-like structures. Prices are a bit steep, but these heirloom blocks are made to last, and will make a wonderful holiday gift this season. We've seen the amazing Tegu Magnetic Wooden Blocks before, but we've never seen colored Tegu blocks, that is, until now. Tegu is now making their beautiful blocks in a rainbow of colors; green, orange, turquoise, pink, and yellow. Like the classic, natural Tegu blocks, these new tinted blocks are still made with child-safe magnetic ability that allow little ones to create magical and steady 3D-like structures. Prices are a bit steep, but these heirloom blocks are made to last, and will make a wonderful holiday gift this season.